TORONTO, March 11, 2016 /CNW/ - World Animal Protection applauds A&W's commitment to become the first Canadian fast food restaurant to source eggs only from cage-free hens. In addition to converting to cage-free eggs in an industry leading 2 years, the company has committed $100,000 to research new housing options. "A&W's commitment to phase out the use of caged eggs in two years is the most ambitious timeline we have seen in Canada," says World Animal Protection Canada's Executive Director Josey Kitson, "A&W was one of the first Canadian companies to phase out eggs from battery caged hens and today's announcement shows that A&W is still committed to leading the way on the welfare of laying hens." A&W's commitment will benefit more than just the hens that supply their own restaurants. The donation of $100,000 will fund work on improving the welfare of laying hens throughout Canada. The vast majority of the 28 million Canadian laying hens are kept in conventional battery cages where each hen lives in a space smaller than an iPad and has little room to stretch her wings or move around freely. Enriched or furnished cages offer more space, about the size of a postcard for each bird, an area for egg laying and some perch space. 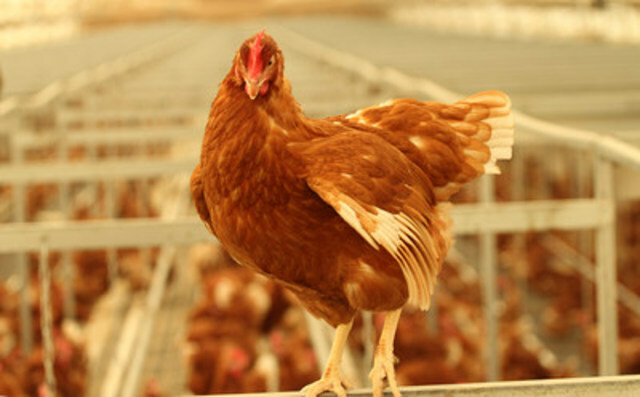 In typical cage-free barns, hens are able to express some natural behaviours like laying eggs in a nest box and perching. In February of this year, the Egg Farmers of Canada announced that they will phase out battery cages in Canada by 2036. While the Egg Farmers will allow producers to choose between enriched cages and cage-free housing systems, it is clear that the future of egg production in Canada is cage-free. "We know that Canadian consumers are concerned about the welfare of the animals that produce their meat, dairy and eggs and that enriched cages do not address those concerns, continues Kitson. "A&W's commitment, along with previous announcements from McDonalds and Tim Hortons provides clear direction to producers that enriched cages are a bad investment."